Bottled Up, Acrylic, 4.5 ft x 5 ft.
More abstract and exploratory, my main motivation in this creation was to deal with my inner turmoil, a result from the death of my infant daughter in 2005. Life, in all its fullness, is good and beautiful. Although things can be bottled up, we can persevere! This painting taps into the human condition; frailties, fears and joys. Varied, colorful, glass bottles and vases fill the canvas entirely. One bottle conveys the human form, another suggests a heart. Upon further inspection, the viewer sees a multitude of images within the reflections and nuances of the bottles. Or, perhaps, the viewer sees the images first, and the bottles secondary. Images depict happiness, dreams, grief, and community. The vessels represent our fragile bodies. The internal images give us a peek into the soul. 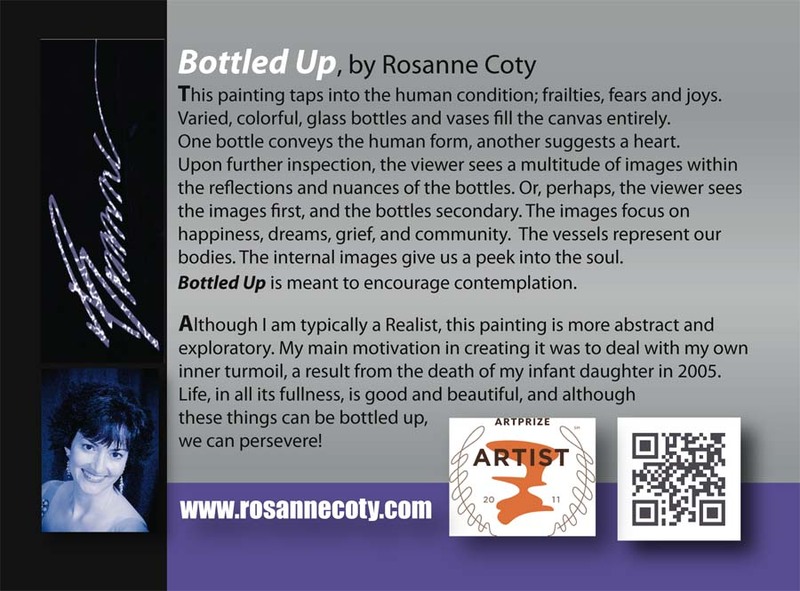 Bottled Up is meant to encourage contemplation. A colorful, distorted reality. By turning the bottles on their side, an abstract world emerges; the painting almost becomes a landscape. Can be displayed either horizontally or vertically, with initial signature in corner. These bottles share a unique perspective. By looking up at them from below, the bottles are elevated in stature. Their vibrant, transparent colors reflect and co-mingle. Bottles more realistic in interpretation.